Lima Half Mile Motorcycle Races! Admission: Online Presale Tickets: General Admission $30 & Reserved Seating $35. Tickets Day of Race: General Admission $40 & Reserved Seating $45. This is the area's Premier Motorcycle Racing event. 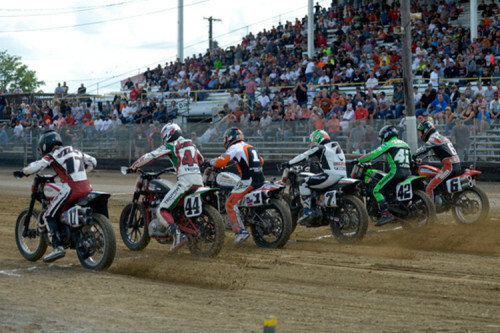 Over 7,000 race fans converge on Lima, Ohio to watch the Grand National Circuit's top racers in the nation participate in the 1/2 mile dirt track race at the fairgrounds. At the Lima Half-Mile, fans are able to get up-close with the stars of the sport during open pits, which takes place before racing begins. Fans can stroll through the pits, watch teams work on their motorcycles, get autographs, take photos, and talk with the stars of the series. Be sure to visit all the vendors, enjoy a variety of food and cold beverages. No coolers permitted. Presale tickets available online at www.limahalfmile.com.